Passionate about animals, Cheryl has worked with animals since early childhood. 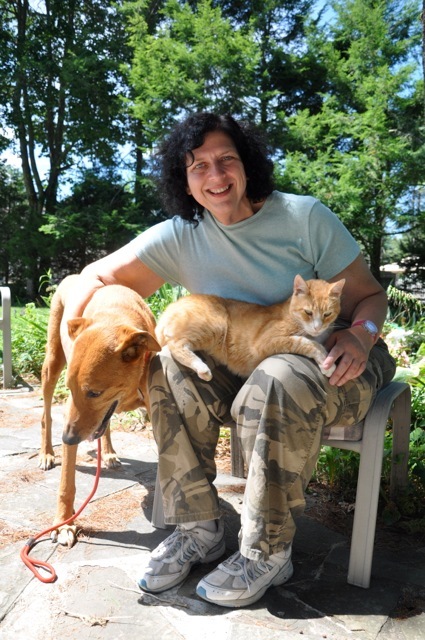 In 1990, Cheryl started Personalized Pet Care to fill a void. Caring pet parents want the best for their pets and Cheryl believes pets are happiest when they remain in their own home environment when their human companions must leave them for vacations, business travel or for any reason. Keeping the same routine and essential services is the basis for her service. The hallmark is the additional care given to keep your pet happy and healthy - exercise, play time, and adherence to medical and training schedules. Pet parents come home to relaxed, well cared for pets. Special care is taken with elderly or special needs pets. Medication administration, preparation of special diets, special feeding rituals and anything unique to your pet's normal routine are part and parcel of the package deal. In addition to petsitting, Cheryl offers dog training services. With expertise in basic obedience training, behavior modification training and years as a shelter volunteer working with a wide variety of dogs, Cheryl is able to establish/maintain the training rituals for your dog. As a unique service, Cheryl not only can provide you with traditional dog training where you and your dog are trained together, but "Walk & Train." "Walk & Train" is the combination of a structured leash walk with training to suit the needs of your dog. There are times when owners are unable for one reason or another to do traditional training. Although the results take longer when the owner is not actively involved with the training and following the same methods, owners do find improvement in their dog's behavior from simply having Cheryl "Walk & Train" their dog. With a strong love for rescued pets, Cheryl also offers two services for those who have adopted or are thinking of adopting a rescue/shelter dog. Cheryl will go with you to help assess the dog of your choice and help you find a perfect match for you, your family and your lifestyle. She also offers a discounted training rate for dogs adopted from established rescues/shelters. Personalized Pet Care's motto is "Only the BEST for Your Pet!" and clients agree the services of Personalized Pet Care by Cheryl truly exceed expectations and allow pet parents to relax when they have to leave their pets at home or need training for their dog.